Further to its news releases on Dec. 18, Dec. 19 and Dec. 29, 2017, Aben Resources Ltd. has increased its proposed non-brokered private placement of units at 13.5 cents each from 1,851,852 units for gross proceeds of $250,000 to 2,024,747 units for gross proceeds of $273,250.84; and it closed the private placement on Jan. 4, 2018, on conditional TSX Venture Exchange acceptance. The private placement is subject to final acceptance by the TSX-V.
Each unit purchased included one common share as well as one share purchase warrant. Each warrant will entitle the holder to purchase one additional common share for one year at a price of 18 cents per share. In connection with the financing, Aben issued a total of 17,500 warrants to finders who introduced certain subscribers to the private placement. Each finder warrant will entitle the finder to purchase one additional common share for one year at a price of 18 cents per share. The company also paid to finders a total of $2,362.50 in cash fees associated with this financing. Shares issued in connection with this private placement and any shares issued as a result of exercise of warrants will be subject to a hold period expiring May 5, 2018. The company intends to utilize the proceeds from the private placement for a coming 2018 exploration and drilling program at its Chico gold project in Saskatchewan and for general working capital purposes. Aben Resources is a Canadian gold exploration company developing projects in British Columbia's Golden Triangle in Saskatchewan and in Yukon. The TSX Venture Exchange has accepted for filing documentation with respect to a non-brokered private placement announced Dec. 18, 2017. Aben Resources Ltd. has made a cash payment of $25,000 and issued 250,000 common shares to Eagle Plains Resources confirming Aben's intention to continue with the existing option agreement on the 4,657-hectare Chico gold project located 125 kilometres east of La Ronge, Sask., and 40 km south of SSR Mining's (formerly Silver Standard Resources) Seabee gold operation. Details of the option agreement are outlined below. Aben intends to carry out diamond drilling on the Chico property in late-February. Permitting and detailed planning for the program is currently underway. Chico drilling activity is expected to be conducted concurrently with a 10,000m winter drill program to be carried out by SSR Mining Inc. on Eagle Plain's Fisher Property, located 6km north of Chico. Chico property highlights include the presence of a 1.5 km-long mineralized structural corridor which is confirmed by geophysical surveys, geological mapping and soil geochemical surveys. Sporadic historical drilling has been completed in the area and has returned high-grade gold intercepts. Eagle Plains in 2016 contracted TerraLogic Exploration of Cranbrook, B.C. to complete systematic fieldwork on the property including a 661 line-km airborne magnetometer geophysical survey, mapping, trenching and soil geochemical surveys. Rock samples collected along this along this structural corridor ranged from trace quantities to 20.2 g/t Au. Soil sample results include numerous highly-anomalous samples ranging to 4.5 g/t gold. During 2017, Aben and Eagle Plains conducted a detailed Induced Polarization ("I.P.") geophysical survey designed to define high-grade gold targets. This work resulted in numerous high-priority drill targets being identified, many of which will be tested during the planned winter program. The overall objective of the 2016 and 2017 programs was to identify mineralization, alteration and structural features similar to those at the nearby Seabee and Santoy deposits. The Seabee Gold Operation has been in continuous production since 1991 and has produced 1.2M ounces of gold from the Seabee and the Santoy deposits. Ore geology at the Seabee Gold Operation consists of high-grade vein mineralization associated with shear zones that transect mafic meta-volcanic and intrusive rocks, as well as granitic rocks emplaced during the regional deformation events impacting the Pine Lake greenstone belt during the Proterozoic. The Seabee Gold Operation and the Chico Project occur within the Pine Lake greenstone belt. Mineralization at the Seabee Gold Operation occurs at the Seabee and Santoy mines, which are located approximately 14km apart. The former is affiliated with the more westerly-oriented Laonil Lake shear zone, while the latter is hosted on a regional north-trending shear zone associated with the Tabbernor Fault, which has been traced over much of the property. Field and underground observations at the Seabee Gold Operation suggest that shear structures nucleated at contacts between granodiorite and meta-volcanic lithologies, with high-grade zones forming at minor flexures. The Tabbernor Fault is a 1500 km-long regional structure which has been traced from as far north as the Rabbit Lake uranium mine in northern Saskatchewan to as far south as the Black Hills of South Dakota, the latter of which hosts the 40M oz Homestake gold deposit. The shared proximity to the Tabbernor structure and similarities in terms of age and tectonic history to the Homestake and Seabee/Santoy deposits was the main driving force behind both Eagle Plains' and Aben's interest in the Chico property. Management cautions that past results or discoveries on proximate land are not necessarily indicative of the results that may be achieved on the subject properties. Aben and Eagle Plains recently acquired 6 additional mineral dispositions for a total area of 1,799 ha located adjacent to the original holdings through a combination of staking and the completion of a purchase agreement with an unrelated third-party (see news release December11th, 2017). Aben is earning an initial 60% interest in the Chico property from Eagle Plains by incurring $1,500,000 in exploration expenditures, issuing 1,500,000 common shares and making cash payments totalling $100,000 over 4 years. Upon earning this 60% interest, Aben may elect to exercise a second option to earn a further 20% interest by incurring an additional $2,000,000 in exploration expenditures, issuing 1,000,000 common shares, and making $50,000 cash payments within two years of the date of election. The discovery horizon in the area is 200-250m. Historically drilling has been done only to 150m. The red dome in the below photo is a massive geophysical anamoly rising to 200m below the surface. Normally I wouldn't get too excited about just geophysics but it's matched on top by geochem, surface sampling over a fairly large surface. When you have this kind of a massive 3d chargeability with surface mineralization I pay attention. Chico is one of three projects ABN has, all are interesting. Last edited by rick; January 12th, 2018, 05:07 PM. Aben Resources Ltd. has received the finalized data from a ground-based induced polarization geophysical survey that was conducted in June, 2017, on the 4,657-hectare Chico gold project located 125 kilometres east of La Ronge, Sask., and 40 kilometres south of SSR Mining's (formerly Silver Standard Resources) Seabee gold operation. Aben Resources holds the exclusive right to earn an undivided 80-per-cent interest in the property by completing $3.5-million in exploration expenditures, issuing 2.5 million shares and making $150,000 in cash payments to Eagle Plains Resources Ltd. by 2020. Aben recently made a cash payment of $25,000 and issued 250,000 common shares to Eagle Plains pursuant to the terms of the current option agreement. Aben intends to carry out diamond drilling on the Chico property in late February. Permitting and detailed planning for the program is currently under way. 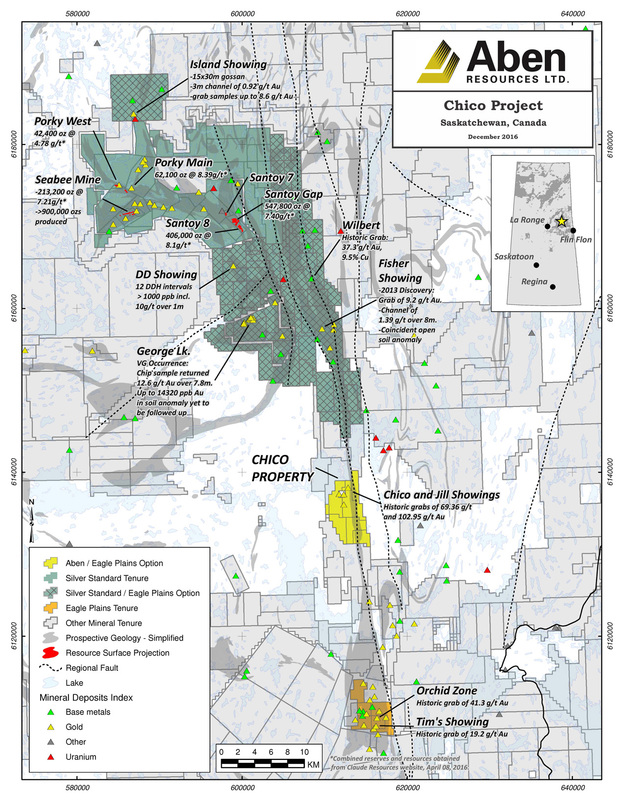 Chico drilling activity is expected to be conducted concurrently with a 10,000-metre winter drill program to be carried out by SSR Mining Inc. on Eagle Plain's Fisher property, located six km north of Chico. The Tabbernor fault is a 1,500 kilometre-long regional structure which has been traced from as far north as the Rabbit Lake uranium mine in northern Saskatchewan to as far south as the Black Hills of South Dakota, the latter of which hosts the 40-million-ounce Homestake gold deposit. The shared proximity to the Tabbernor structure and similarities in terms of age and tectonic history to the Homestake and Seabee/Santoy deposits was the main driving force behind Aben's interest in the Chico property. Management cautions that past results or discoveries on proximate land are not necessarily indicative of the results that may be achieved on the subject properties. Aben Resources is a Canadian gold exploration company developing projects in British Columbia's Golden Triangle, Saskatchewan and Yukon. Storm of the century is the way it was described to me. Chico camp was not set up, they just had it cleared when the 100 year storm hit. Now they are digging out again, will get the camp set up, and drill start is expected on the 15th. Was talking with Jim re Forest Kerr and the Justin projects that will be worked this year. I like all 3 projects, Chico is of course drill ready and the truth machine will tell us what it knows soon enough. Forest Kerr is a Golden Triangle project, will be lots of news from it and surrounding plays as well as others in the Skeens Arch, area will heat up as all the players get to work and more is known about the area. Justin is going to get a better look at last years vein swarm discovery. Aben Resources Ltd.'s planned and permitted Chico drill program in Saskatchewan has been suspended as a result of a request by the citizens of the community of Pelican Narrows and members of the Peter Ballantyne Cree Nation. Details of the intended program were previously announced in a news release dated March 1, 2018. Eagle Plains Resources Ltd., as optionor and project operator, informed Aben of this request after a March 21, 2018, community meeting was convened in Pelican Narrows, attended by local stakeholders and Eagle Plains management. Following the meeting a decision was made by Aben and Eagle Plains to suspend the program. Aben may revisit plans to explore the property in the future, following meaningful consultation with the community and PBCN members. Government permits to undertake the proposed drilling program were issued on Feb. 28, 2018, by the Saskatchewan Ministry of Energy. Aben Resources looks forward to the upcoming exploration season at the Forrest Kerr gold project in British Columbia's golden triangle after a successful drilling program there last year. Aben Resources is a Canadian gold exploration company developing gold-focused projects in British Columbia, Saskatchewan and the Yukon territory. Aben is a well-financed junior exploration company with approximately 62.7 million shares issued and outstanding. For further information on Aben Resources, visit its website.